Sunday was spent setting up the compound where the trench will be laid out on Wednesday. It measures 20 by 15 metres, with the north-eastern edge following the top of the bank along the south-western side of the hollow way of the former Stotfold road; to the south-east, it crosses the village street hollow way, to just beyond the top of the bank. The gateway is on the south-western side of the enclosure. It encloses most of a building platform in the south-western corner of the crossroads formed by the village street and the Stotfold to Baldock road. There were problems clearing the grass, which did not respond well to the strimmer (it kept clogging). It has grown very long, despite being mown about a month ago. By 2.15 pm, the fencing was complete. 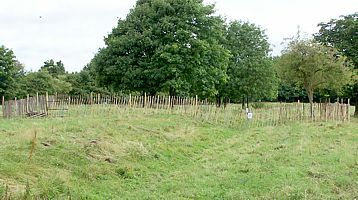 Posted on 6 August 2008, in Fieldwork, Norton Church Field Dig 2008. Bookmark the permalink. Leave a comment.